Great shots are often a combination of experience, planning, timing, effort, and of course, luck. 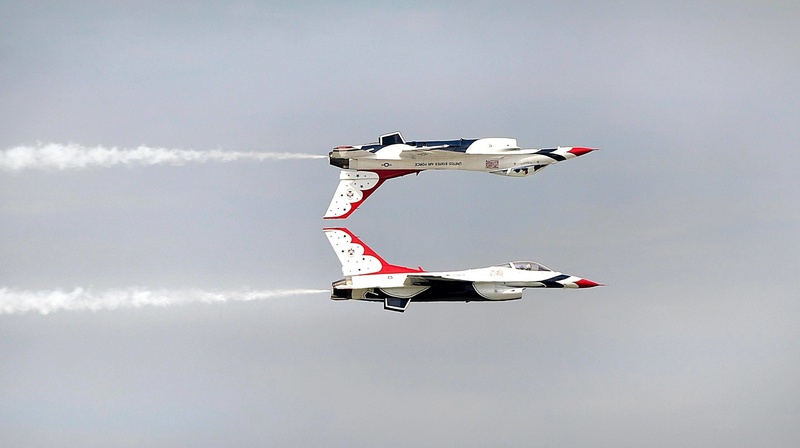 A talented newspaper photographer got the shot of a lifetime while photographing an air show in Niagara Falls earlier this year. 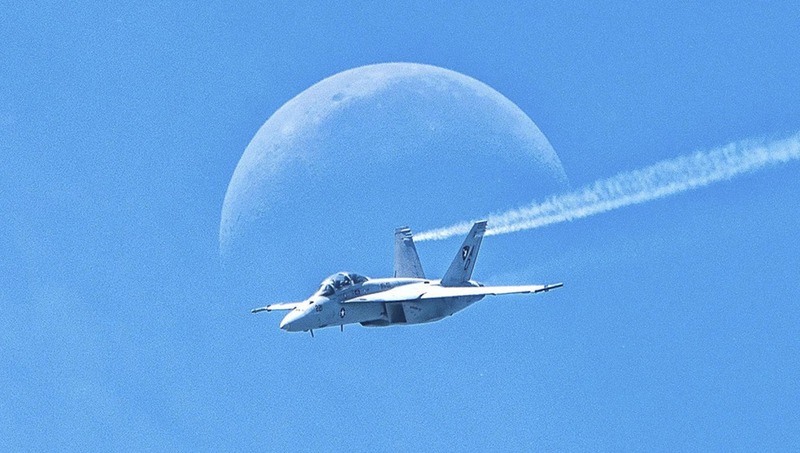 James Neiss has been photographing air shows on and off for over 30 years. His job working for the Niagara Gazette newspaper, located in Niagara Falls, New York, puts him in the right place at the right time for a number of amazing photo opportunities. Being a true shutterbug, Neiss puts his all into getting the shot and has a loyal local following who enjoy his artistic work as well as his editorial photography. I met Neiss after passing each other carrying cameras a number of times while out and about in the area. I became aware of his work online more and more and we became friends after he went out of his way to write me an encouraging message about my photography. Neiss is a humorous self-critic who often refers to the days when his hair not only had color but was worn in a well-maintained mullet. He makes talking about photography an open invite to anyone and everyone as time permits with his busy shooting schedule. Neiss has been shooting since he took photography as an elective in his senior year of high school 39 years ago. When I asked him if he had any tips for other photographers, he said to go out and shoot as many photos as you can. He has been looking back on his first seven years of photography after embarking on a film scanning project. One thing he found was that he would only take four or five photos of something, preserving the exposures on each precious roll of film. Things were much different those days. You had to pay for the film and pay again to have the film developed. When Neiss first started at the newspaper all that ended. 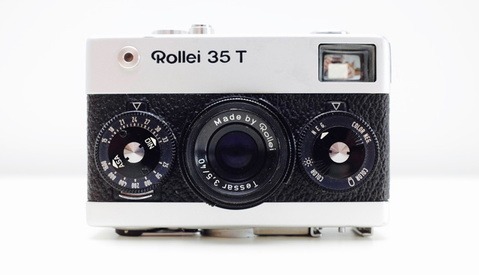 On day one, the photo chief tossed him a brick of film. Ten rolls of 36 exposure Kodak Tri-X truly felt like a shopping spree. He found it both confusing and exciting at the same time as he was sent out and told to burn through them without coming back till he did. It started a high paced career of documenting both the everyday and extraordinary events of western New York. If something is interesting enough to shoot once, shoot it ten times. Storage is cheap and digital allows for so much trial and error learning. Neiss is also a firm believer in not being a camera snob. The best camera is always the one you have with you. Neiss adds that he has sold a number of prints made from iPhone photos, so why pass up on the moment for the sake of quality expectations. 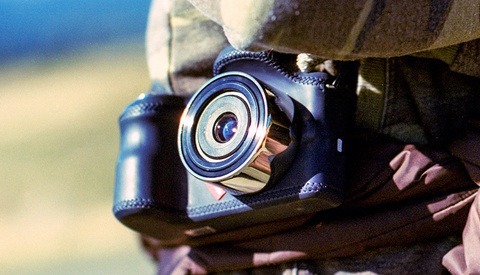 He suggests stopping immediately and capturing the moment if you see something. I know I have felt subconscious or double guessed stopping on the side of the road when I see something worth photographing. This has resulted in passing up some good shots so his advise makes a lot of sense. Rolling down the window and getting what you can always be better than nothing. Just be sure to be safe; some busy roads are illegal to pull over on for a reason. 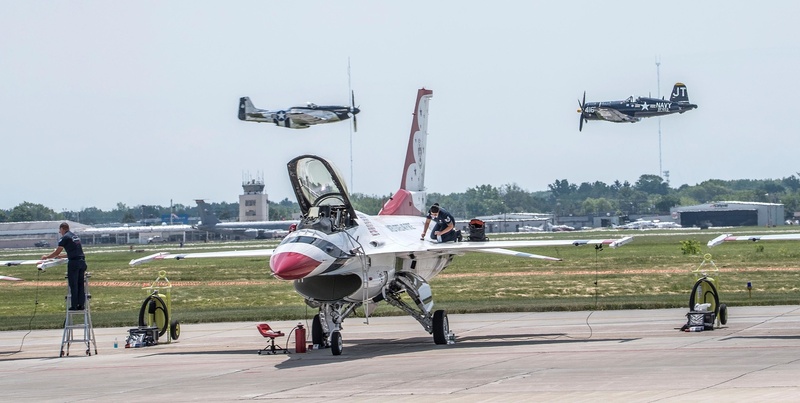 Neiss was covering a military families-only edition of the 2018 Thunder of Niagara International Air Show back in June planning on getting some great close-ups with his longest lens. He shoots with a Nikon D750 and loves the high resolution. He also relies on the high ISO performance with being able to capture great photos in low light with limited visible noise. While his favorite lenses consist of the Nikkor 70-200mm 2.8 and the Nikkor 17-35mm 2.8, the shot we’re featuring was shot with a far-reaching Tamron SP 150-600mm. While the wide apertures don’t offer the sharpest results in Neiss’s testing, shooting at f/10 and above result in nice crisp images. To get this very memorable shot of a Navy F-18 Super Hornet in front of the moon, Neiss got himself situated out on the runway so no buildings or people would impede his view. 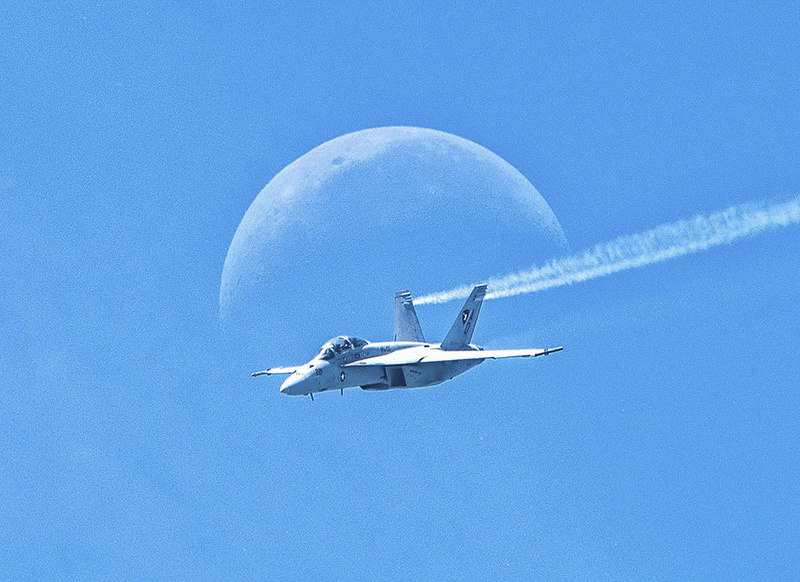 He follow-focused the jet and tracked its path right in front of the moon. The lens compression at 600 millimeters is significant and the final composition looks so otherworldly Neiss received a lot of flack from fellow photographers jokingly accusing him of Photoshopping the shot. You can see below that the progression of the jet happened fast. The third frame was the winner and you can see why photography has such a split second nuance to it. Even with today's fast firing digital cameras, you need a little bit of luck to pull off such a wonderfully framed composition on a fast moving object. 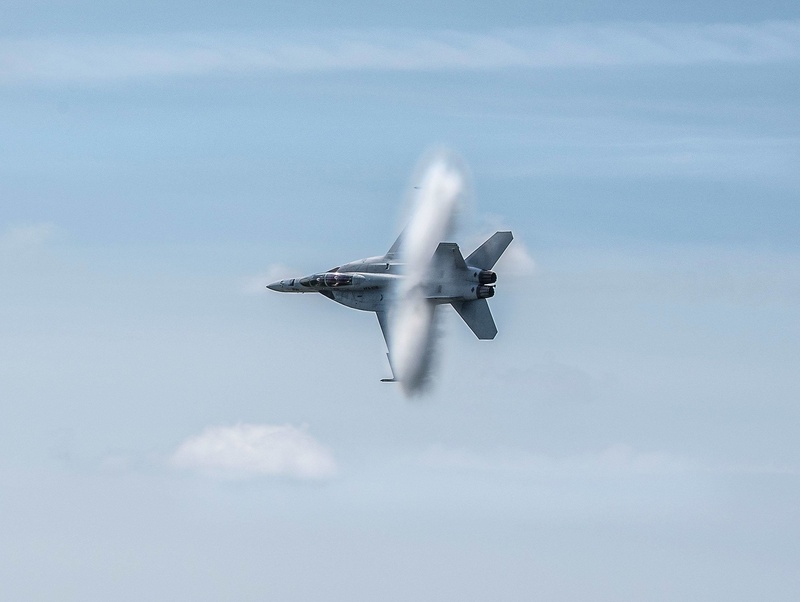 Make that very fast with the F-18 capable of almost 1200 miles per hour. The shot actually required very little post-processing. Simply rotating and cropping the image to achieve a more horizontal view of the jet was all that was needed. Neiss feels so fortunate to have lived through the transition from wet darkrooms to film scanners, then digital cameras and memory cards, all processed on a computer. Less time processing film and printing pictures in a darkroom equal more time to get out there and shoot. Neiss was notified by a friend that his photo was used in the Editor and Publisher magazine as the photo of the month. Editor and Publisher is an authoritative journal covering all aspects of the newspaper industry so this came as quite an honor. Here is the original Facebook post where I saw the photo. It went small town viral with 111 shares. Neiss is the kind friendly photographer others root for so I was psyched to see him post this shot and then have it receive the reception it did. Don’t forget to get out there and meet the photographers in your area. Providing support and encouragement always seems to find its way back in some form. All photos used with permission by James Neiss. Thank you, Sharon. Glad you enjoyed! Love the rivalries! Thanks for your service, John.